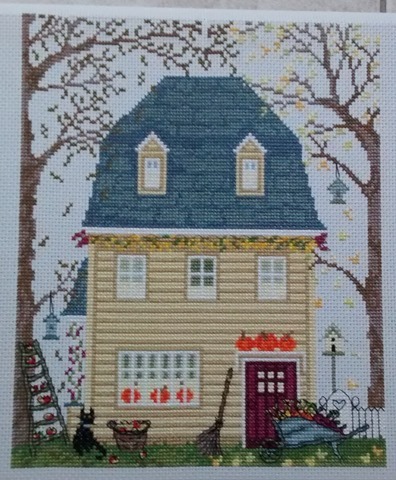 You might remember that I stitched one of Bothy Threads New England Houses for my sister’s birthday last year. There’s one for each season and this one is Spring. Well, she loved it and asked me to stitch the other three season’s houses for her next three birthdays. So, her present for 2016 was Fall. I wasn’t able to show it to you until her birthday had passed. I’m now busy with Summer. 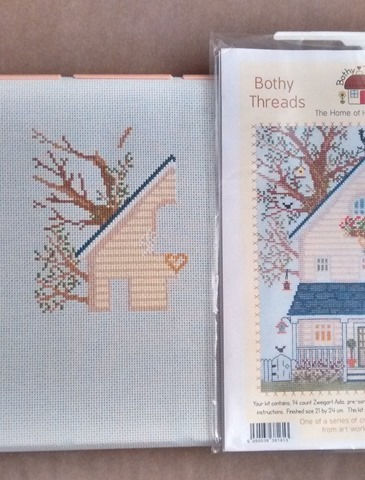 It’s very easy to stitch and, as is usual with Bothy Threads kits, it’s very well put together with a clear chart and quality materials. No, I’m not getting paid for the review. I just love everything by Bothy Threads :-). I did pick up winter to start 3rd but there’s a lot of white stitching and some sparkly thread in that one so I thought it would be better to wait until there’s some proper daylight. Anyway, Summer is growing really fast. I don’t think my sister will be waiting for another two birthdays before she has them all. These are so lovely! Someday I may try a Bothy Threads as they look charming and I like the way they are put together. My biggest problem as I have quite a few other WIPs that I really would like to get done before I purchase and start anything new. These houses are very, very tempting, though. 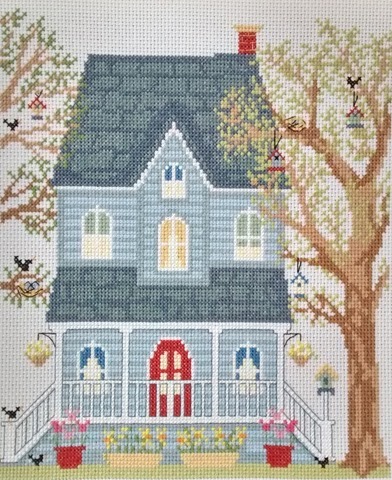 These houses are very easy to stitch with quite large blocks of the same colour. If I were you, I’d finish a WIP or two first and then have a Bothy Threads kit as a reward. How does that sound? That sounds like a plan especially considering I will need to save for the kit cost. Something to look forward to as well as a reward. She’s going to have a lovely little group once you’re done, the lucky thing. Very pretty kits indeed. Well, she only had the second one for about half an hour and then announced she was going to frame it. The initial plan was to wait and have them all framed the same. Hopefully, she’ll wait a little longer. I’m working on it! It’s a tribute to your work – she can’t wait to have them on the wall! That’s what she said. Actually, it was more like “I’m not waiting another two years!” It wasn’t even my idea to do one per year. What a lovely sister you are. These are very pretty. Yeah, well she’s much nicer than me LOL. I love their Cut Thru series as well 🙂 There’s at least another two of those in the stash. They are fun to stitch and easy enough that they don’t need too much concentration. These cute houses are so lovely. Your sister is lucky to have you beavering away for her. I expect she will receive the remaining two houses in double quick time. Your cross stitch is always so neat and well finished. I do wish my eyes would work better so I could still cross stitch because these are the sort of things I would love to do. I know a few people who would like to receive them. However I am happy to look at your work while I carry on quilting. LOL. They are going to be a great grouping. I think I’ll check out this BOthy Threads…. They’ve got something for everyone. I’ve also completed two of the Cut Thru series. You can see those if you click on the “2013 Finishes” tab at the top of the blog. I have stitched a few Bothy Threads kits myself and find them so easy to follow, plus they are beautiful too! Lucky sister! They are definitely one of my favourite brands and there’s something for every taste. They are lovely! I have a Bothy Threads kit that i’m itching to start! I can’t fault them. Which one have you got? Those are some sweet looking houses. I can’t wait to see the Summer one come to life.